I recently had to develop an interface to get bug information out of an older Bugzilla installation (version 4.x). The older installation didn’t support REST and only supported the older XML-RPC interface. If you have a project, you can install xml-rpc.net using NuGet. 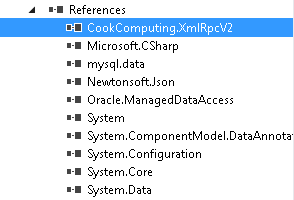 Once the XMLRPCNET packages are installed, you should be able to see the References added to your project. You can get more information on the XML-RPC spec for Bugzilla, here. For the actual Bug.get call, the documentation is, here. The way the xmlrpcnet packages work is by setting up and interface that then is turned into a proxy for the XML-RPC service. 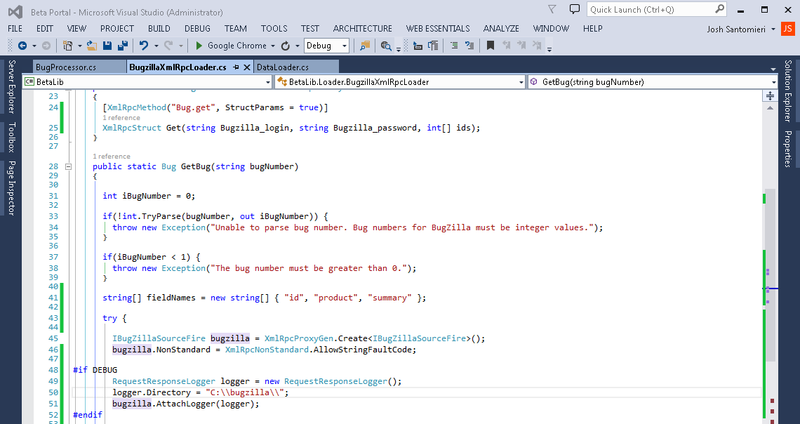 Here is the basic and super simple interface for getting a bug out of Bugzilla using the “Bug.get” interface. In this code, we are defining the interface and providing the URL to our Bugzilla installation (XmlRpcUrl) and then defining the “get” method. To the get method we are passing in a login, password and the IDs of the bugs we wish to be returned. In the later specs, you can pass a Bugzilla_login and Bugzilla_password variable to any interface and it will login as that user. This keeps us from having to mess with the Login interfaces, and keeps it simple for this implementation. If everything was done correctly, this will populate the “returnValue” with the information for the bugs you provided in the format of an XmlRpcStruct (an XmlRpcStruct is basically an array of key/value pairs like a Dictionary). The XmlRpcStruct return value will generally have two keys, “bugs” and “faults”. Each bug will generally contain the following fields (in no particular order). For more details on these, reference the Bugzilla documentation, here. These values are accessed like how you would access a Dictionary<string, string> value in C#. This is an example of some of the logic in an application, not all of the components are there, but it should give you a good starting point for anything you may be doing. This will create files containing the XML Request and XML Response. These are very helpful for debugging. If you don’t need the files, just comment out or remove the code. Hope it helps! Have any questions? Feel free to ask them in the comments below.